In a recent Bloomberg podcast, Edward Alden, a journalist and fellow at the Council on Foreign Relations, was asked if the Trump administration favored business or labor. He replied that they are trying to help both. We think Alden is correct in his assessment which is one of the reasons why analyzing the direction of policy with this administration is so difficult. It appears that one of the goals of the president’s trade policy is to bring production back to the United States which would benefit labor. At the same time, tax policy has generally favored capital. But, the most underestimated benefit to capital may be deregulation. George Washington University measures the pages of the Federal Register, which is the official journal of the federal government. It publishes agency rules, proposed rules and public notices. 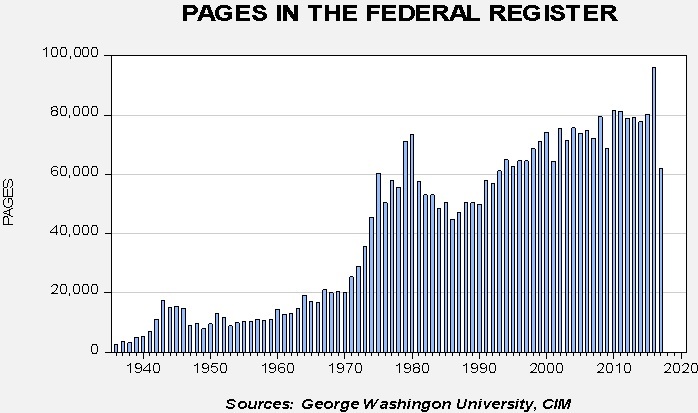 So, the number of pages in the register says something about the number of regulations. The idea is that the more pages added to the register signals an increase in regulation. The decline seen in the first full year of the Trump administration is remarkable. The drop from 2016 to 2017 was 35.4%, which exceeds the 21.2% decline in 1981, Ronald Reagan’s first full year in office. The only year that was larger was 1947, which saw a 39.6% slide. That drop was likely due to postwar changes. 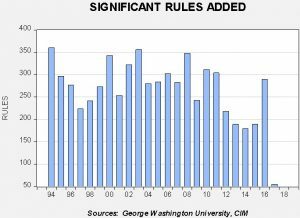 Another measure is called the “significant rule changes,” a policy measure created during President Clinton’s first term. The decline in 2017 was unprecedented. Only 55 new rules were added in 2017. That is clearly the fewest on record by multiples. 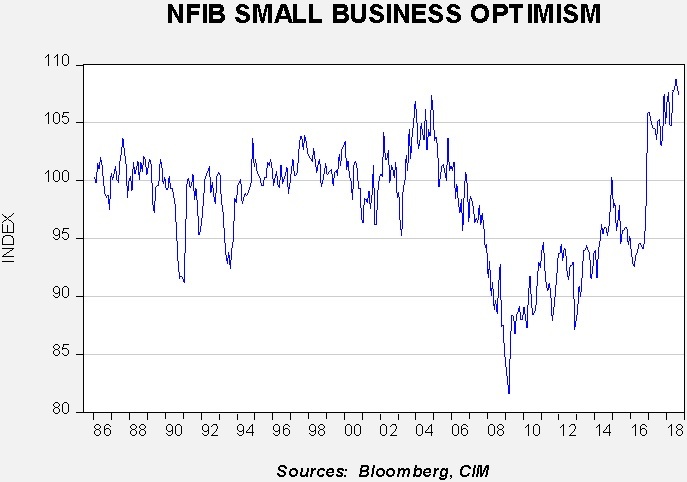 The drop in regulatory activity is partly why small business sentiment has been so strong. 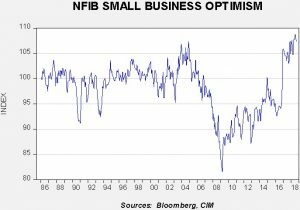 The jump in small business sentiment mostly tracks the drop in regulation. 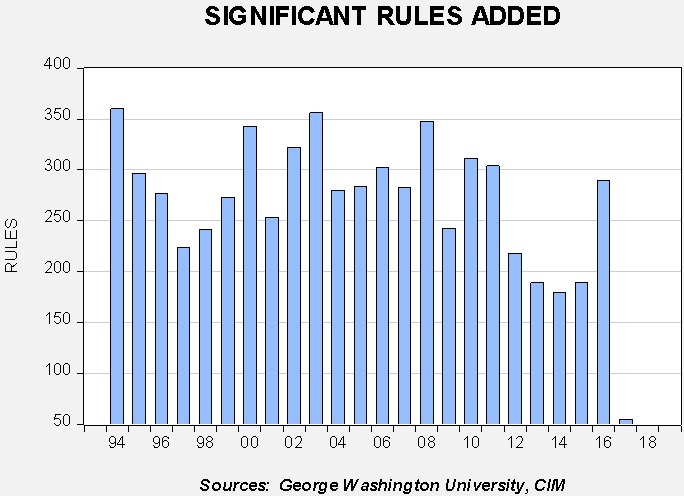 A persistent complaint from small business leaders during the Obama administration was the regulatory burden. Not only did President Trump promise to reduce regulation, he actually accomplished it. Tax changes and deregulation have been supportive factors for equities since the November 2016 presidential election. However, as Edward Alden noted, the Trump administration has tried to placate both capital and labor. Recent market action, with equities selling off despite a civil meeting between Presidents Trump and Xi and the yield curve flirting with inversion, suggests that the financial markets are pressing President Trump to choose. Will it be capital or labor that wins out in the end? If capital is going to win, a lasting trade ceasefire needs to be declared. If President Trump sticks with tariffs, and there are ample indications that he intends to for now, then the financial markets appear to be preparing for recession. A recession in 2019 will jeopardize the president’s chances at reelection in 2020. Our expectation is that, at some point, President Trump will “blink” and tone down the trade rhetoric. But, that is an open question for now. https://www.bloomberg.com/news/audio/2018-11-27/surveillance-china-general-motors-with-cfr-s-alden-podcast Alden’s segment begins at 16:00 minutes and the response in question is at 18:40. For an analysis of the impact of inversion, see our Asset Allocation Weekly (6/29/18).